Westview Nursery and Landscape Co. continues to be family-run by brothers (front row, from left) Gregg and Keith Houck, Gregg’s sons Will (far left) and Colt (center), and Keith’s son Derrick. Although a windstorm winds severely damaged the business in 2014, patriarch and owner Eugene Houck made sure the nursery was rebuilt to continue serving the community. Westview Nursery and Landscape Co. continues to be family-run by brothers (front row, from left) Keith and Gregg Houck, Gregg’s sons Will (far right) and Colt (center), and Keith’s son Derrick. Few Wacoans can remember a time when Westview Nursery and Landscape Co. was not present on Valley Mills Drive offering colorful flowers and growing greenery of all kinds. “We opened up here on Valley Mills Drive when it was the middle of farmland with a single lane and nothing within two or three miles. Now, we are in the middle of the main road in Waco,” said Keith Houck, now president and co-owner of Westview Nursery. The men were seeking a new way to make a living. 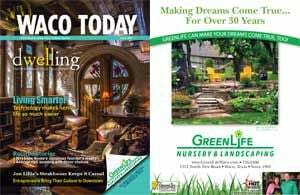 “We had a relative in Tennessee who was in the nursery business, so that’s what made them think about going in the nursery business,” Keith said. Brother Gregg recalls those early days when he was just a boy. The original location was down the street for about a year before moving to its current long-standing location, he said. While Eugene passed away in January, he left a legacy that sons Keith and Gregg honor by continuing the solid business practices and excellent customer service that created a loyal customer base. Keith expresses his pride in the business his father and grandfather built. Loyal customers from the earliest days of the nursery still come in to spruce up their yards and chat with the Houcks. They called the senior Houck “Red,” his high school nickname. “He was one of the hardest-working men I have ever known in my life,” Keith said. “He was a very smart businessman. Everybody you talked to would tell you they respected him and his work ethic and his business sense. He was very well-respected all around town. Keith said his father’s drive to make his business successful was evident every day. “You would see him out here with three or four people around him and he would be the one digging the hole,” he said. “Every truck that came in he was in the middle of it. He was at the front counter and was very big on customer relations and customer service. His work ethic was none like you’ve ever seen. That determination was tested in October 2014 when a fierce wind trampled through Valley Mills Drive, leaving a path of destruction where the beloved nursery had been for so many years. People asked if Westview would return. For the elder Houck, that was never a question. “That was pretty devastating,” Keith said. “That was getting in Dad’s later years in being the nursery business. He was always very family-oriented and did this for his family. “He didn’t want to leave this earth without knowing we had jobs and security. We did rebuild it and never one time did we ever think about selling it. He wanted this legacy to last for many, many more years, so we got it built back up and open for business. Keith, 61, and his brother, Gregg, 62, are carrying that family legacy on with their own sons. Their older brother Barry was involved in the nursery business, too, until about 10 years ago. Gregg said he enjoys the sense of family as they work together to manage the company’s two locations and other services. “I feel like we’re going to move forward fine,” Gregg said. “I’ve got two sons in it and Keith has a son in it and we’re going to keep doing what we’ve been doing for 65 years. The Woodway store is located at 10000 Woodway Drive. “My nephew, Keith’s boy, Derrick, does all of our irrigation work, and he does selling, too,” Gregg said. With about seven employees at the Woodway store and 16 at the Valley Mills Drive location, Westview Nursery has ramped up for spring and continues to serve the community. Going on four generations now, Westview Nursery manages the business with the same tenacity and service that created their excellent reputation. Keith agrees that this business philosophy has sustained their business through the years. “We’ve got some of the best, oldest, most reliable customers who have been coming in here for years,” he said. “We have a reputation for customer service and quality. When someone comes in here they are going to get waited on, probably before they even get out of the car. “We have customers who have been coming here since it opened up about 65 years ago. Providing that level of expertise advice extends to landscaping as well. Westview Nursery and Landscape Co.
Mon-Sat, 8:30 a.m. to 5:30 p.m.
Sun, noon to 5 p.m.